Barska scopes are growing in popularity. Widely-accepted as the “best bang for your buck” rifle scope, Barska is beginning to outshine some of her competitors. In this article, we wanted to take a moment to give you a landscape of the different scope brands and how Barska fits in. We’ve included detailed reviews of what we believe to be the best scopes that Barska sells today. Barska is an American brand founded in 1994. This California-based firearm, gear, and optics company turned the market upside down. Before Barska, (particularly with binoculars and scopes) hunters and shooting competitors had to invest significantly for highly-functional optics and scopes. Barska made these optics and scopes more affordable for gun enthusiasts. Barska, from a manufacturing standpoint, does two things well. First, they use cheaper, foreign parts (primarily from China) but demand that those parts meet very clear specifications. As a result, Barska can create their products at a much lower cost. Second, the company’s quality assurance and supply chain are unusually streamlined. There is less opportunity for poor quality parts to “get lost” in the process. Also, quality assurance controls focus on priorities in manufacturing rather than putting as great importance on non-vital aspects of the product’s construction. In plain English, this means that Barska has a business model that eliminates waste and focuses on the key parts of the manufacturing process. This allows the end product to travel from inventory parts to the finished product on store shelves in a short time frame. How Does Barska Compare to Competitors? Next to military-grade scopes, Barska products are among the most precise and durable. Many AR-15 owners complain about how difficult it can be to find a scope that works well. Barska has more than once delivered AR-15 scopes at a precision and compatibility where its peers have fallen short. XOPin scopes favor hunting rifles, though their scopes and optics do work well with tactical weapons. While technically a competitor to Barska, Beamshot does not compete in the realm of scopes so much as in optics and firearm flashlights. Pinty carries a wide variety of scopes and optics. Most scopes allow for several attachments, such as Pinty optics and flashlights. This is a fairly well-regarded scope brand that serves both hunting and tactical rifles. CVLife not only competes with Barska on scopes and optics. They also create nice-quality bipods and assault packs. Vortex creates rifle scopes and optics almost exclusively for hunting rifles. They are slightly more elite than the vast majority of popular scopes, which means that they are priced on the medium to high side. Built for law enforcement and military, ATN is top-of-the-line. Prices tower above even Vortex prices. Therefore, this may not be a brand for you unless you are in law enforcement. We favor the Barska scopes for many reasons, but the most immediate reason is for their amazing “bang for your buck.” It is extremely difficult to find a scope brand so consistently accurate in its class as the Barska scopes. As such, we reviewed our top five picks and their category of performance. The scope is super easy to install. Strong, bright picture adds above-average clarity when sighting through the lens. The scope is built to handle the rugged outdoors. It is waterproof, shockproof, and fog proof. The sturdiness and accuracy of the sight allow you to zero your rifle typically in less than ten rounds. If you are using the Picatinny or Weaver rails, you may need to find a Monstrum Rail Attachment instead of using the attachment included. When you change the magnification, this could change where your round lands on the target. Many users recommend picking one mag setting and leaving it there. In rifles, plinking refers to the act of target practice, usually associated with metal cans in an informal setting. With a 32mm objective lens and 3-9 times magnification, this is a great .22 rifle scope. 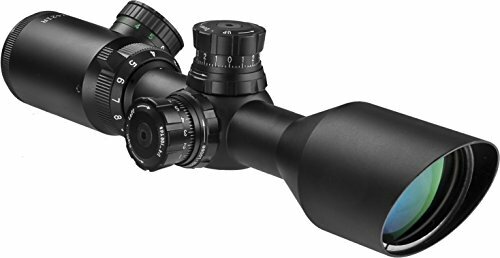 In addition to plinking, this scope is ideal for .22 rifle or rimfire hunting. While it doesn’t have any way to adjust parallax (this is typical for a .22 sight anyhow), it does have ¼ inch turn adjustments for windage and elevation. Manufacturers do not often go the extra mile with .22 and rimfire rifle scopes. But Barska delivers greater plinking accuracy with this scope. It is an economical option that will seriously enhance your hunting and target practice. Even in wet conditions, the fog and waterproofing work well. The portability of the tripod and case allow for easy breakdown and transportation. Settings stay, as opposed to slowly changing if you do not intentionally adjust them. At ranges under 400 yards, you will be able to make out surprisingly fine details on your target. At ranges beyond 400 yards, you will begin to see a significant decrease in picture clarity. With ongoing use, some customers complain that the picture quality begins to deteriorate. This extra-lightweight and sturdy setup combined with the super-smooth turning dials allow you to focus without any shake in your picture. It is a straight-body design. It also comes fully-coated, meaning that extra measures have been taken to reduce glare and increase clarity. In spite of all the positive feedback from customers, Amazon still only has a combined rating of 3.9 stars (at the time of this review). This is likely due to the fact that it performs surprisingly well for the budget. Some customers swear by the optics at as far away as 1000 yards on a good day. Others insist that the scope only works optimally at less than 300 yards. The setup is sturdy and easy to adjust the focus without fear that a tripod bump will change the dials. The 20-times zoom is great for surveying a large area before zooming in on your target at 60-times zoom. The magnification shows great detail at as far a distance as 75 yards. Many customers report that they love how the scope looks on their rifle. The shockproof aspect is solid, allowing shooters to achieve tight groupings. This site works as easily on a plinking rifle (such as a .22) as it does on an AR-15. Speaking to the illuminated reticle, customers are saying at times that the reticle is too bright and at other times too dim. This could be more of a battery issue rather than a product defect. There is some uproar over the misunderstanding of IR in the product description. For tactical rifle optics, IR usually refers to an infrared ray seen while using night vision goggles. For this scope, IR simply refers to the illuminated reticle. 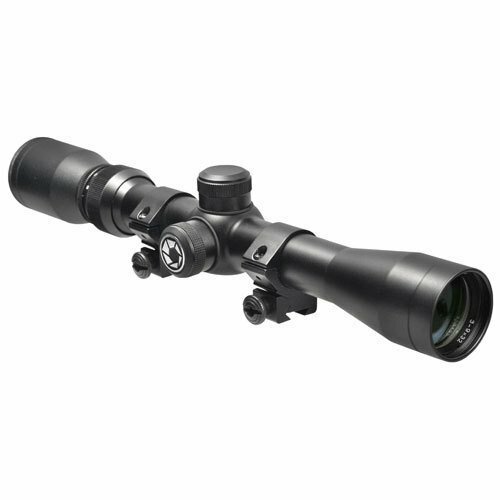 Perfect for hunting and tactical weapons, the Barska 3-9x42 IR 2nd Generation is sturdy, clear, and high-tech. The reticles will illuminate and the front shade enhances your picture free of glare. This scope includes dials to adjust parallax, windage, and elevation. The “easy grips” allow you to adjust these settings while peering through the optic. For the slightly more serious-minded than the plinking crowd, this scope performs at the same level of many more expensive optics of its kind. At short to medium distances (less than 800 yards), this scope will deliver consistent accuracy and hold the settings you arrived at during your zeroing in session. The sight gives a clear picture in nearly any daytime lighting. This is a great quality long-range scope for a modest budget. Some customers have complained that weapons with stronger recoil tend to not hold settings/focus in as well. For more serious hunters and medium to long-range target practice, the Barska IR SWAT Extreme offers magnification nearly as powerful as the Barska 20-60x60 Waterproof Straight Spotting Scope above. As with the 3-6x42 IR 2nd Generation, IR stands for illuminated reticle. This, combined with the parallax, windage, and elevation settings allow you to hunt with greater accuracy at a longer distance. There are not very many reviews on this scope yet, but most of the ones that exist are low on complaints and high on praise. If you need something more rigorous than a .22 rifle scope and want to be able to shoot accurately at targets beyond 500 yards, this is the ideal scope for you. Your picture will be surprisingly clear and the high magnification allows you to adjust your settings just right. The scope installs easily with little fuss. Zeroing-in is simple. Most are able to zero-in in under 20 rounds. The mil-dots and BDC (bullet drop compensation) in the optic are easy to use. The sight is quite sturdy, retaining its zero settings even after falling from table height. 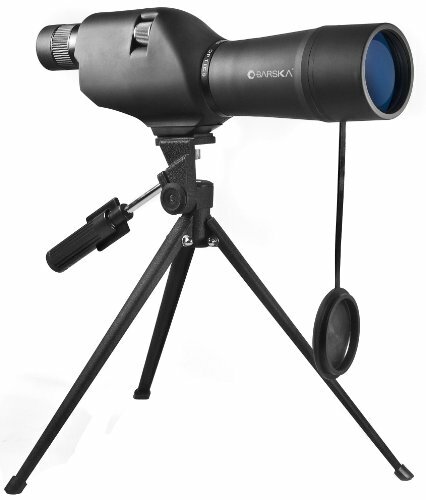 Several customers wish that the reticle was illuminated like the two Barska scopes above. If you love your M16s and AR-15s, this scope is a must-have. It allows you to keep your iron sights (and continue to use them, if you wish) while adding the advantage of a scope. The Barska 4.20 Electro Sight Scope installs on the carry handle on your tactical rifle. While the magnification is only four times, it does offer a bullet drop compensation so that you can adjust your aim accordingly at longer distances. The lenses are fully-coated and the scope is waterproof and fog proof. However, in case you are new to the world of electro sights, manufacturers build them specifically for the type of target shooting that mimics room clearing. Often electro sights are good for close-range shooting on the move, such as shooting competitions. This scope was specially built for competitors and lovers of tactical weapons. Notwithstanding, this is for a somewhat niche crowd of gun enthusiasts (hence the low amount of reviews), most of the reviews are more than positive. As you’ve likely noticed in this review of Barska scopes, each scope serves a unique purpose. Some scopes do well across a variety of gun types (such as the 3-9x42 IR 2nd Generation Rifle Scope). But others really only do well for certain purposes, such as short-range competitive shooting (the 4x20 Electro Sight Scope) or plinking with your .22 (3-9x32 Plinker-22 Riflescope). Barska scopes meet a variety of shooting demands on a friendly budget. We hope that you’ve been able to use this review to help you select your ideal scope.